The Jewish People Policy Planning Institute in Jerusalem has released a study on the "The Jewish People in 2030: A Positive Future or a Nightmare Reality? How to Affect the Future Today." This multi-year study explores four alternate realities that could befall the Jewish people in 20 years, ranging across the spectrum from Thriving, Defending, Drifting, Nightmare. 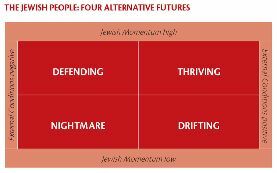 The paper, titled 2030: Alternative Futures for the Jewish People, summarizes a strategic thinking process conducted by the Jewish People Policy Planning Institute, dedicated to the analysis of possible alternative futures for the Jewish People in the year 2030. The project, led by two senior JPPPI fellows, former Director General of the Ministry for Foreign Affairs, Amb. Avi Gil and Dr. Einat Wilf (who recently joined the Knesset), highlights several key intervention points to enhance prospects leading to thriving, and to prevent the development of a nightmare future. The paper was presented for the first time on Wednesday, February 17, 2010, to the members of the Conference of the Presidents of Major Jewish American Jewish Organizations, who were guests of the JPPPI in Jerusalem. JPPPI's Founding Director Avinoam Bar-Yosef noted the uniqueness of the project, which grapples for the first time with planning based on future scenarios for the Jewish People and for the Jewish civilization. He emphasized that many leading planning professionals and some of the best minds of the Jewish People took part in the thinking process, among them Dr. Henry Kissinger, Prof. Larry Summers, Ambassador Dennis Ross, Ambassador Stuart Eizenstat, Prof. Yehuda Reinharz, Prof. Irwin Cotler and others. The process benefited from the constant guidance and advice by Prof. Yehezkel Dror, Founding President of the JPPPI. The future is most likely to comprise some of the elements of each of these trends. The paper presents the variables affecting the alternative futures, identifying policy instruments decision makers of the Jewish People could employ in order to increase the probability of a thriving future for the Jewish People and to decrease the probability of negative futures. The authors' opinion is that the Jewish People has never been as strong as it is today, in terms of both the military power and global standing of Israel, and the 'soft power' embedded in the political and economic powers of the Jewish community in the US. Cyberspace has contributed significantly to Jewish development, using innovative information and communication technologies that have enhanced communication between the State of Israel and Diaspora communities, between various Jewish organizations, and among Jewish individuals around the world. The vast majority of Jews reside in the world's wealthiest countries. Although, in terms of numbers the Jewish People has not yet recovered from the Holocaust, in other major respects it has demonstrated survivability and vitality, in particular, the creation of a sovereign nation�a guarantor of existence-- in its ancient homeland for the first time since the destruction of the Second Temple. Nevertheless, the Jewish People continues to be in a unique situation unprecedented in other nations. Dangers of many kinds threaten it, and under specific scenarios, these dangers could bring about a future the paper defines as "nightmare." In this scenario, the lack of action, apathy and systemic failure of the Jewish People combine with worsening external conditions to cause significant damage to Jewish life as a collective as well as to Jews as individuals. A mega-terror attack or a catastrophic event that would harm concentrations of Jewish population, shrinking global Jewish demographics. Severe deterioration of the Jewish identity, which comes to be perceived as dangerous and/or unattractive. As a result: a sharp decrease in the number of children receiving Jewish education. Turkey is out of the European Union and grows more radical; the West is less inclined to wage wars; the proliferation of weapons of mass destruction continues unabated, including to unstable and fanatic countries as well as non-state actors; also in the Middle East, terror is liquidating central Jewish populations; terror brings the world back to the chaos of the Dark Ages; collapse of world order. A real decline in the influence and power of the Jewish community in the US. Israel is perceived as a 'pariah' state; a mass brain drain continues unabated, emptying Israel of high quality human resources; decrease in interest in science and technology among Jews and the curtailing of investments/divestment in Israel deny the Jews of an important source of security, wealth and respect in the international arena. The Jewish leadership is mediocre, corrupt and out of touch. The Jewish People does not play any significant role in finding solutions to the problems of mankind, and there is a sharp decrease in Jewish knowledge and education. However, Gil and Wilf stress, this future is a 'worst case scenario.' Indeed, while the Jewish People is incapable of influencing all the events and trends included in this scenario, it is possible to intervene in many of them, make informed and well-thought-out decisions, and take concrete actions. The same is true for two of the other, less negative scenarios analysed in the paper: the "drifting" scenario, in which the external conditions affecting the Jewish People are positive, but the will to preserve Jewish identity is weak; and the "defending" scenario, in which the external conditions are essentially negative, but the will to preserve Jewish identity and secure Jewish survival is relatively strong. All of these scenarios contain certain elements of force majeure, while others are predictable, susceptible to intervention and malleable. 2030: Alternative Futures for the Jewish People wishes to point out the ways to secure a thriving future for the Jewish People, in terms of culture, quality of life and sense of cohesion, based on Jewish pluralist values, with Israel as the core state of the Jewish People. * To develop an attractive and durable/enduring Jewish identity, especially among the younger generations, and to enhance the relative standing of Israel in terms of human development indices. * Regarding Aliyah, the state should adopt a friendly policy towards Jews who are willing to divide their time between Israel and their country of origin. It is urgent that forms of "multi-local Aliyah" be developed, to accommodate those who wish to have more than one place of residence, in Israel and abroad. * To promote an comprehensive peace agreement in the Middle East, with the support of Islamic countries, the US and the majority of the world's nations. * To initiate "Tikkun Olam" enterprises by the Jewish People � projects that, among other things, upgrade the Jewish People's soft power and global standing. * To invest in improving Israel's relative standing in the world, aspiring to turn it into a model country, and to create a Jewish quality of life that would be competitive with other locations in the world in general, and in the West in particular. * To develop new forms of cooperation between Israel and the Jewish communities around the globe based on partnerships and joint ventures. * To work towards promoting young leaders within the Jewish People; Jewish organizations must offer the younger generation a larger role to play. * To establish a Jewish Leadership Academy for the training and support of emerging leaders.